Gut wrenchingly sad Country songs, peppered with a wry wit. In lesser hands the songs here; about drinking, cheating and breaking up would be Cliché Country; but Grant Langston has such a clever way with words, melody and it has to be said a cheeky wit; this will become one of my Top 10 Country albums of 2015 and it most certainly is ‘more Country’ than anything mainstream radio will let you hear. Opening track, Drive is so laid back it nearly falls over as Grant meets a girl in a bar, buys her a whisky and discusses them getting in his car and leaving town; giving it ‘the finger’ in the rear window. Now, dear reader….this is my kinda Country Music! While this is as far from a concept album the narrators breaking marriage and their drinking habits inhabits the songs like a cheap paperback novel and has you praying for a happy ending; but with their psychotic love for each other and even stronger love for alcohol, what could possibly go wrong? 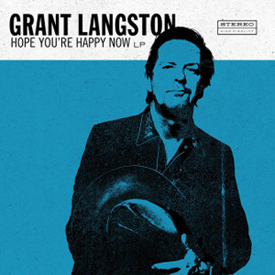 Langston certainly has a way with words; on Breaking Hearts who’s not going to love a song that opens with “You found me in your garbage cans/stinking drunk and rummaging/looking for a scrap of our old life” – sheer genius; and the weeping pedal steel and soft drumming accompaniment will have even the hardest of hearts reaching for a tissue. The Trigger is the finest Murder Ballad that I’ve heard for years, and has a Western feel to it as Langston sounds like he’s sitting around the camp fire singing about ‘his gal that he left behind’ or is he in a prison cell? Tucked away in the middle of the record is a really cool Alt. Country Rocker called Born to Ride, that must be the highlight of a gig; it’s certainly one of the highlights here. By the time we get to the Twangfest that is I Work Too Hard; you will be willing Langston to run as fast as possible from his relationship; but still remain fascinated about what is coming up next. Straight outa Bakersfield, this Honky Tonk tune really lifts the mood; and in true Country style our hero stays for one more round like a punch drunk boxer. Grant Langston? He’s channeling George Jones via Dean Martin and Robbie Fulks, providing the type of Country and Western Honky Tonk music people tell you isn’t made anymore….it is; and it’s here. Thankfully no dogs died in the making of this record…..only a marriage.